Eura is highly experienced in a range of conservation techniques for treating historic or archaeological metals. 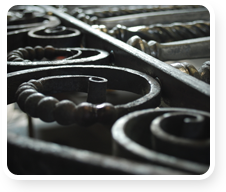 Our key philosophy is to minimise harmful or intrusive intervention, ensuring that all treatment is reversible, and to retain as much of the historic material, including historic surface finishes, as is possible. All metals undergo a chemical reaction on exposure to oxygen, water or chemicals. This reaction can be intended and attractive, in the case of patination on a bronze statue, but in the case of corrosion it can also be disfiguring, or can structurally weaken and endanger an object if left unchecked. All of our work is preceded by careful analysis, research, and consultation with the owners of the object, and all our techniques and materials are fully documented through the process. We are happy to deal with objects as small as a portrait bust to objects as large as the Gulbenkian award-winning 322 foot long wrought iron hull of Brunel’s steamship SS Great Britain.